Are you sick of my mushroom posts yet? Here’s a change of scenery: Snowbird Central, the southern Gulf Coast of Florida. This is the only truly tropical corner of the continental U.S., where white shoes and blue hair are the norm. We went to visit the rellies, but the fish called, so we took a flyer and booked a half-day trip as a Christmas gift to ourselves. Guided fishing ain’t cheap. Yet when time is short and terra is incognita, it makes sense to pony up and learn something from the local pros. Enter Captain Pat with his dandy flats boat and years of experience fishing the Naples backcountry. 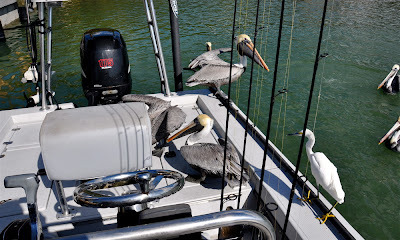 Our trip would take us into the maze of mangroves that make up the inland waterways of southwestern Florida, to the edge of Rookery Bay and the northern limit of the Ten Thousand Islands. Just after 8 a.m., Captain Pat cut the engine and poled us into a slot where a deep, narrow cut held fish up against a line of mangroves. We baited up with shrimp and tossed our lines into the channel. Almost immediately I heard what would become a familiar refrain: "I’ve got a fish!" Riley’s pole was doubled over. 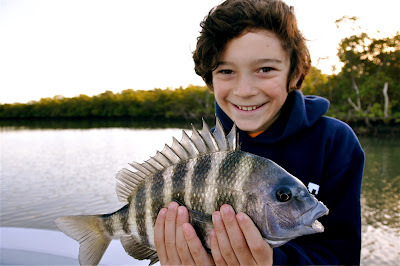 He reeled in a beautiful sheepshead of 13 inches, a keeper. Food requirements met, we settled down to enjoying the sport. Riley had six fish to the boat—sheepshead, mangrove snappers, and sundry other backwater finners—before I landed a lowly catfish requiring careful release due to poisonous spines. This was met with general merriment from my fellow anglers. "You’re more of a fly-fisherman," my boy tried to console me. Captain Pat assured me the next spot would offer some fly-friendly water. Indeed, the next spot was leeward where the incoming tide moved swiftly over a shallow bar adjacent to a deep pocket of jade green water. Captain Pat produced a flyrod and I happily gave up my bait rod. Second cast—bang!—fish on. A few seconds later, fish off. Several more casts and nada. The good captain examined my fly and popped on what he called a tip and what I called a cheater, a little piece of shrimp. I tossed out the ungainly thing and felt an immediate tug. Thankfully the tip was gone when I reeled in. 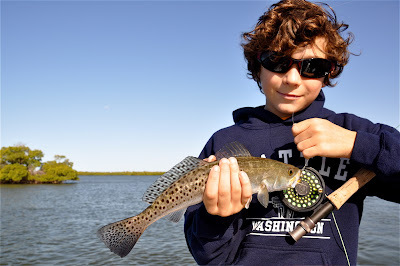 I suggested we try a different fly rather than another cheater, something a little heavier to get down in the feeding lane, and the captain tied on a lead-eye fly that looked like a variation of a Crazy Charlie. Next cast, fish on. 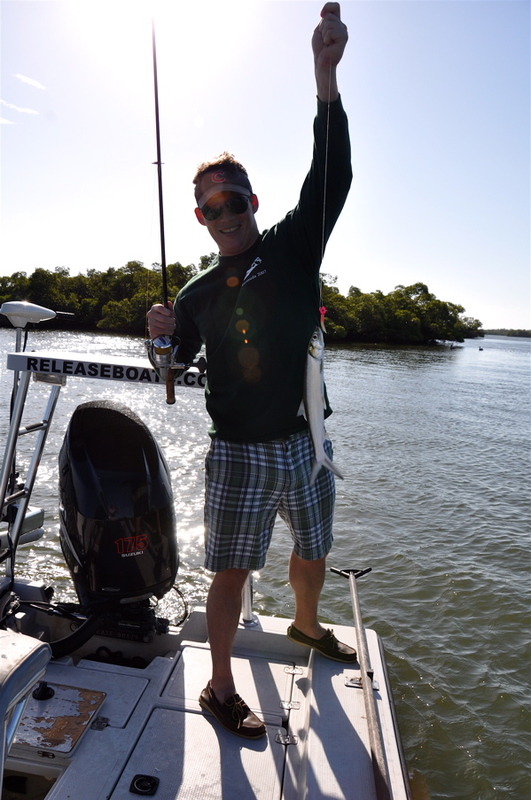 I put the cork to it this time and hauled in a beautiful ladyfish, crowing "Let the record show no shrimp in evidence." This earned me several guffaws of derision from my mates and the nickname No Shrimp. The next forty-five minutes were hot, with a fish on nearly every cast, all of them ladyfish, which are also known as poor man's tarpon. My brother Whit and Riley had good action too, with ladyfish, seatrout, and snapper. My fly-fishing success didn’t escape notice from the boy. As you’ll recall, he’s been practicing his fly-casting this past year. I relinquished the rod and took up the video camera. The kid continues to astound me. 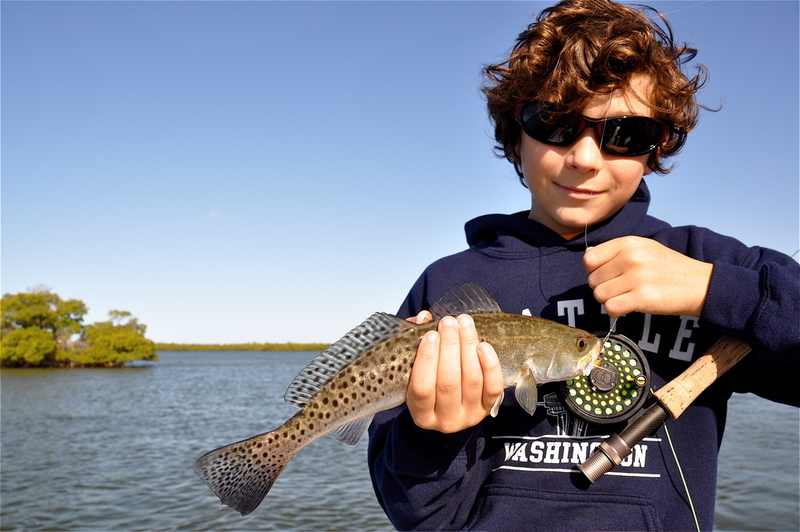 I'd chalk it up to beginner's luck, but this so-called luck seems to be a recurring feature of his young angling career. He nailed fish after fish on the fly, finally turning to me with a hint of both pride and lament in his voice. "Looks like we'll have to share the name No Shrimp, Dada." 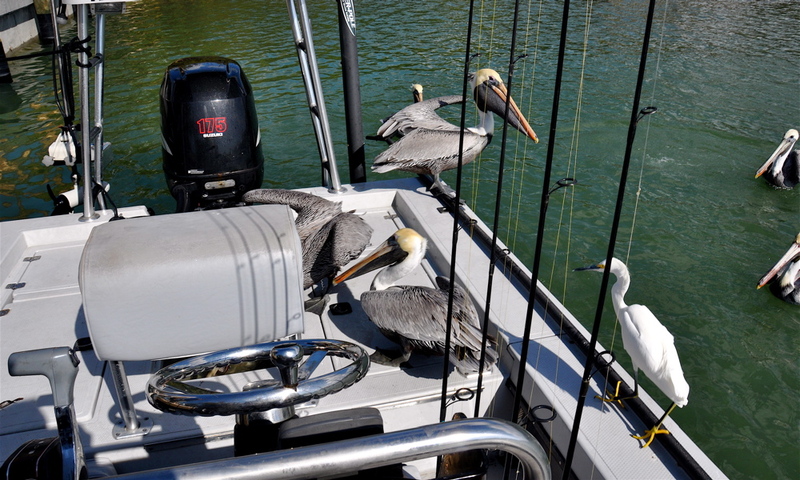 Back at the dock the pelicans and egrets sensed an easy meal. For lunch we sautéed the sheepshead fillets in butter with a simple seasoning of salt and pepper, a mixture of dried herbs, and a light sprinkle of Old Bay. 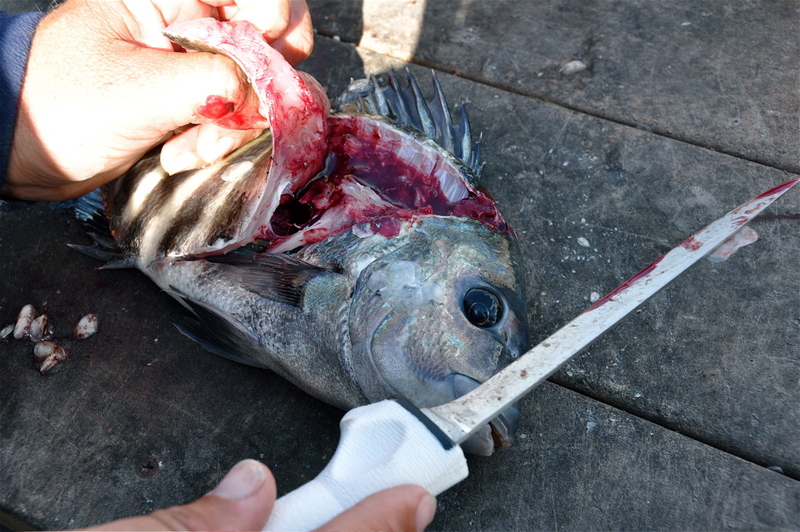 Sheepshead is lovely fish, white and flaky with a mild flavor. 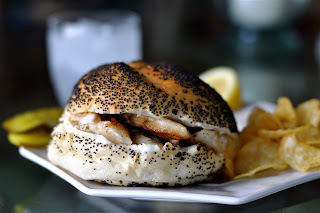 They made an excellent sandwich on a fresh Kaiser roll with mayo for No Shrimp Sr. and No Shrimp Jr.
Hey Lang, I didn't know you were going to be in my neck 'o the woods...glad you got into fish. I'm going out in the morning as we have a great tide around 8am so will hope for redfish and speckled trout and whatever else comes along. Thanks, No Shrimp, for the journey, diagonally from OlyPen Land. Warm water and lots of fish on sounds mighty sweet right now in the cold north. By the way, never too many mushroom posts! Ladyflyfish - Dang, I forgot you were down there. Expect a visit in the future--we've got relatives on both sides of the family in the area. 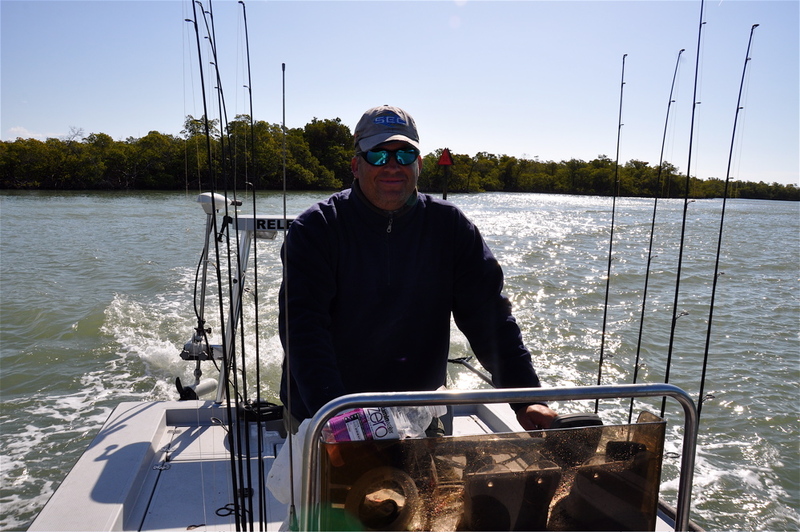 I'm sure you're familiar with forager Green Deane's web site too; he's in FLA.
Mike - Yeah, no worries about the rod guides freezing up in SW FLA, though apparently it got down to the 30's before our arrival, which is unusual. Dada that was super fun! !